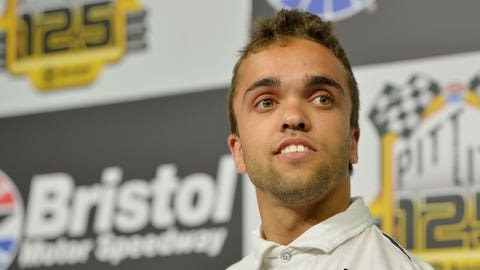 Rico Abreu has turned a lot of heads in both the sprint car world and NASCAR K&N Series and has been named to the 2015-2016 NASCAR Next class. The past and future of the sport came together Tuesday morning when the 2015-2016 NASCAR Next class was introduced at the NASCAR Hall of Fame in Charlotte, North Carolina. The program, which is in its fifth year, is used to help prepare young up-and-coming racers for a potentially successful career in NASCAR’s top three national touring series — Camping World Truck, XFINITY and Sprint Cup. Past NASCAR Next members include 2014 XFINITY Series champion Chase Elliott, 2014 Sprint Cup Series Rookie of the Year Kyle Larson, and youngest NASCAR national series winner Cole Custer — who returns to the program this season. The drivers named to the 2015-2016 class come from a wide range of backgrounds both on and off the track, with some having already competed in the NCWTS or NXS. "The NASCAR Next initiative spotlights the future of NASCAR, a collection of promising young talent who have shown the potential to one day reach the highest level of our sport," said Jill Gregory, NASCAR senior vice president for Industry Services. "Alumni — and current members — of the NASCAR Next program are achieving success at the national series level, and we are confident that this class will build upon that foundation of excellence for many seasons to come." Industry insiders and veteran racers evaluated the candidates between the ages of 15-25. Each candidate must be actively competing in a NASCAR touring or weekly series. Rico Abreu (23, Rutherford, California, Twitter: @Rico_Abreu) — A 2014 USAC national champion and winner of the 2015 Chili Bowl, he has two top-10 finishes in three K&N Pro Series East starts, his first season racing in stock cars. Nicole Behar (17, Otis Orchards, Washington, @NicoleBehar33) — Tied the series record for highest finish by a female driver in just her fifth K&N West start with her second place mark at Irwindale Event Center, and has top-10 finishes in four of six West starts. Kyle Benjamin (17, Easley, South Carolina, @kylebenjamin71) — This Roush Fenway Racing developmental driver earned his first K&N Pro Series win at Bristol Motor Speedway, and is the youngest race winner in ARCA history. James Bickford (17, Napa, California, @Bickford_James) — The 2014 K&N West Sunoco Rookie of the Year earned his first win at State Line Speedway last season and finished fifth in the season championship. William Byron (17, Charlotte, North Carolina, @WilliamByron) — With a win at Greenville Pickens Speedway and three top 10 finishes, he sits atop the K&N Pro East season championship standings. Cole Custer (17, Ladera Ranch, California, @colecuster00) — He holds the records for youngest pole award and race winner in both the NASCAR Camping World Truck Series and NASCAR’s touring series, and led late in the Truck race at Martinsville Speedway earlier this season. Ruben Garcia Jr. (19, Mexico City, Mexico, @rubengarcia4) — The runner up in last season’s NASCAR Mexico Series season championship, he had one win and 10 top-10 finishes there while also competing in three NASCAR XFINITY Series races. Austin Hill (21, Winston, Georgia, @_AustinHill) — Had three consecutive K&N East wins, in the final two races in 2014 and the 2015 season opener at New Smyrna Speedway where he captured his first pole award and led every lap. Jesse Little (18, Sherrill‘s Ford, North Carolina, @jesselittle97) — Had a win at New Hampshire Motor Speedway, four top-five and 10 top-10 finishes in 2014 to finish fourth in the season standings. Won the pole at Bristol Motor Speedway in his 2015 K&N East debut. Dylan Lupton (21, Wilton, California, @LuptonDylan) — Was the 2014 K&N West championship runner up with a win at Kern County Speedway and registered 14 top-10 finishes; made his NASCAR XFINITY Series debut at Phoenix International Raceway in March. John Hunter Nemechek (17, Mooresville, North Carolina, @JHNemechek) — Earned six top-10 finishes in 10 NASCAR Camping World Truck Series starts in 2014, and won the prestigious Snowball Derby Late Model race at Five Flags Speedway in December. Dalton Sargeant (17, Boca Raton, Florida, @DaltonSargeant) — Has a win at Kern County Raceway Park in the West this season, and four top-five finishes in five combined East and West races.